Plas Bodegroes is a Grade II listed Georgian Manor House. The garden has a majestic beech avenue (if you can time your trip in May it will be carpeted with bluebells) and pretty walled courtyard garden. The restaurant has a Michelin Star. 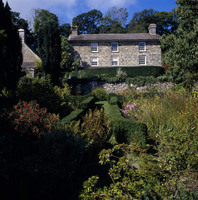 Gardens to visit while staying at Plas Bodegroes include Plas-yn-Rhiw (11 miles) and Portmeirion Gardens (18 miles).